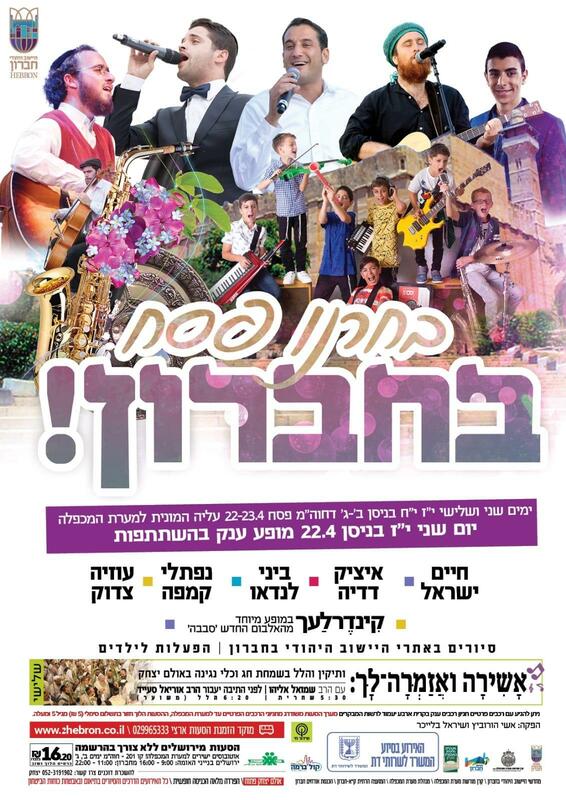 The annual Hebron Passover music festival will take place Monday April 22, 2019 in front of the Cave of the Patriarchs / Cave of Machpela. The Hall of Isaac and Rebecca will be open to the public on both Monday April 22 and Tuesday April 23. The largest section of the Tomb of Machpela, it is usually reserved for Muslim prayer services. The Jewish holiday of Pesach is one of the ten days a year as per our rotation agreement that Jewish prayers will take place. This area includes the memorial markers for Isaac and Rebecca and the small well-like opening to the underground burial chambers. Free guided tours of the historic sites throughout the Jewish neighborhoods will take place and child-friendly fun activities for the whole family will take place at the newly inaugurated Tel Hevron archaeological park. The Hebron Visitors Center and Museum at Beit Hadassah will be open featuring the popular film "To Touch Eternity" which dramatizes the history of the city. On Tuesday morning morning Shacharit services with Rabbi Shmuel Eliyahu, Chief Rabbi of Safed will take place at the Hall of Isaac, an unforgettable experience!